Posted on November 3, 2015, 8:20 pm, by Andy, under Books, Horror. The story: “Night Surf,” collected in Night Shift. First published in 1969 (but revised heavily for its inclusion in Night Shift a decade later). Wikipedia entry here. Spoiler-filled synopsis: A small band of teenagers has survived an apocalyptic plague that has wiped out most of the rest of the world’s population. But they’ve succumbed to a hopeless nihilism, and are starting a descent into barbarism. As the story ends, one of them falls ill, and the others realize that they may not be immune to the plague after all. Not quite like this. But I can’t miss a chance to post the greatest video game cover art ever. My thoughts: “Night Surf” is a quiet, sad post-apocalyptic story told from the perspective of the Bad Guys. In most grand post-apocalyptic stories, the plucky heroes of the tale eventually encounter a band of barbaric marauders roaming the wastes looking for victims. These marauders are usually more than a little crazy, often bloodthirsty or even cannibalistic, and are led by the most clever or brutal of their number. Or they’ve formed a sick, murderous religious cult that they believe protects them from extinction. They’re a dark mirror of the heroes: heroes cling to their humanity in the face of apocalypse, but these lost souls have surrendered their humanity and live cruel, almost beastlike lives. “Night Surf” paints us a picture of the sort of people who, having somehow survived the apocalypse, are on the verge of embracing madness and nihilism. Despite their survival, they’ve lost all hope for their future, and lack the moral strength to rebuild… or do much of anything besides wait around for death. As the story begins, they have just crossed a line into barbarism: they’ve murdered a dying plague victim as a sort-of-joking sacrifice to any dark gods out there that might spare them from the plague. They don’t really believe it, but what can it hurt, right? Bernie, the main protagonist, remembers just enough of his conscience to understand that what they’ve done isn’t funny or appropriate; it’s horrible. But he went along with it anyway. He’s a bitter, unlikable person, cruel to his girlfriend (a fellow survivor) and constantly pulled into memories of the times before the plague, when everything was OK and they weren’t bad people. Little actually happens, plot-wise, in “Night Surf;” it’s mostly a simple portrait of despair. As the story ends, it’s looking like everyone is going to get what’s coming to them: one of the group of survivors comes down with plague symptoms, and the rest of them begin to process the fact that their perceived immunity might be just one more cruel cosmic joke. It’s a sad and understated story, which feels strange to say given that it features a killer plague and a band of murderous survivors. King effectively balances the hopelessness of the survivors’ lives with memories of more innocent times, with the result that you feel pity for these lost characters, rather than anger or hate. 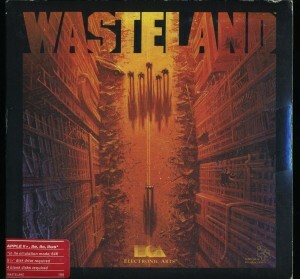 “Night Surf” has an obvious connection to King’s post-apocalyptic novel The Stand, and is presumably set in the same universe as (or in an early version of) that novel. In The Stand, a superplague wipes out most of the world population, and a ragtag band of survivors bands together to rebuild society. The lost souls of “Night Surf,” if they survive the plague, would almost certainly wind up in the camp of The Stand‘s villain, who gathers weak-willed and evil-inclined survivors into his cruel community. This is a good story that cuts deeper than I expected. And it’s got me eyeing my copy of The Stand, which is surely due for another re-read one of these years…. Next up: By happy coincidence, King has just released a new short story collection, The Bazaar of Bad Dreams. I don’t think I can resist, so let’s go ahead and look next at the first story in that collection, “Mile 81.” I’ll be tackling this at a slower pace than before… which gives you some time to run out and buy a copy! Posted on November 2, 2015, 8:08 pm, by Andy, under Books, Horror. Whelp, the the aforementioned hiatus has continued. The “busy and distracting” elements I vaguely referred to in my last post actually turned out to be a medical condition the details of which I will spare you; but which has made it difficult to do much of anything in the evenings. Most of the time, when I get sick, a part of me is excited about the prospect of being forced to stay in bed and reading. However, I’ve at last met my match in a medical condition which keeps me from being able to read for any significant length of time. That said, I figure I made it about halfway through my latest Stephen King short story project and I’m eager to continue, albeit at a reduced pace. 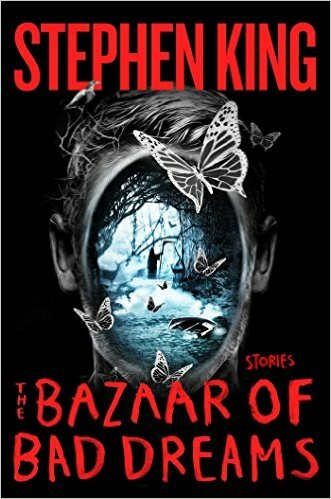 By a strange coincidence, this week sees the release of a new Stephen King short story collection, The Bazaar of Bad Dreams, which I plan to pick up. If I can get some regular posts up about the stories therein, I would very much enjoy that. Any other King fans out there who plan to pick this up? I don’t usually pick up King novels when they’re new (I have a big backlog of older King novels to read first), but I can’t resist a new short story collection. Posted on October 20, 2015, 11:48 pm, by Andy, under Uncategorized. Apologies for the long pause in the Stephen King story writeups. Things have gotten a bit busy and distracting this month. But we’re still on for “Night Surf,” which I’ll likely get to in the next day or two. In the meantime, if you’re following along, I’ve got my eyes on one more King novella to cover this month—”The Mist,” from Skeleton Crew. Posted on October 16, 2015, 10:54 pm, by Andy, under Books, Horror. The story: “Battleground,” collected in Night Shift. First published in 1972. Wikipedia entry here. Spoiler-filled synopsis: After murdering his latest target—a toy company executive—a hitman receives a package in the mail… from the victim’s mother. It’s full of little G.I. Joe toy soldiers, who come to life and wage an extended battle against the hitman in his high-rise apartment. My thoughts: Short, simple, and fun, “Battleground” isn’t the sort of story that invites deep reflection or discussion. There’s just something wonderfully appealing about the thought of a troop of little green plastic soldiers running around performing cute little military maneuvers. But let me point out a few things. First, by an odd coincidence this is the second story featuring a hitman protagonist that I’ve read this month. I don’t think King does this especially often (King superfans, please correct me); but a hitman does have a few benefits as a protagonist in a horror story. For one, they’re usually armed and dangerous, so you can drop them into tight situations and expect that they’ll put up a good fight. For another, they’re by definition bad people—so while we might cheer them on as they face off against supernatural threats, we don’t mind when they inevitably die in the end. They deserve it. Secondly, this story, short as it is, accomplishes something that many horror films and stories do not: it skips the usual extended sequence where the protagonist, confronted with evidence of the supernatural, spends a long time questioning his sanity and trying to explain away the situation rationally. When the reader/audience knows for certain that the supernatural element of the story is real, it’s tedious to wait for the protagonist(s) to finally catch up. In “Battlefront,” we get to jump right into the action because Renshaw, the hitman, always puts the practicalities of survival first: it might make no logical sense that he’s being attacked by toy soldiers, but he’ll ask the troubling questions after he’s taken care of the threat. Unfortunately for Renshaw, he’s not going to survive this engagement. He puts up a good fight, taking down toy helicopters and dodging rocket attacks as he makes a fighting retreat into his apartment’s bathroom. After a humorous nod to World War 2 general Anthony McAuliffe’s famous “NUTS” letter, Renshaw comes up with a desperate plan to sneak around the outside of the high-rise and surprise-attack the toy soldiers with a homemade Molotov cocktail. Unfortunate for Renshaw, he underestimates the firepower at his enemy’s disposal; he is blasted to pieces when the soldiers detonate a toy nuke. Although “living dolls” and other animated toys have a history of being utterly terrifying when deployed in horror stories and film, the animated soldiers here are not scary; I was cheering them on throughout and hoping they’d manage to take down Renshaw. It’s a funny story, and like “The Reaper’s Image” early this month, makes for a nice bit of filler to read in between more intense King short stories. Next up: “Night Surf,” in Night Shift. Posted on October 15, 2015, 10:40 pm, by Andy, under Books, Horror. The story: The Langoliers, collected in Four Past Midnight. First published in 1990. Wikipedia entry here. Spoiler-filled synopsis: A handful of passengers on a red-eye flight across America wake up to find that the rest of the passengers—and the plane’s crew—have vanished into thin air. They manage to land the plane (one of the group is a pilot), only to find that the world is gray and dead—they have gone back in time, but it turns out the past is an empty shadow of the present. And strange creatures called the langoliers, who “tidy up” history by literally devouring the past, are headed their way. My thoughts: The Langoliers was the story that launched my decades-long Stephen King obsession. I was in late high school (so 1992 or thereabouts) when my mom came home from the library with a copy of Four Past Midnight. I had never read anything by Stephen King before, and in fact viewed him with faint suspicion and distaste. To this day I’m not sure what led my mom to pick up that book for me from the library, but I’m glad she did. I read two of the four novellas in Four Past Midnight before the book had to be returned to the library: The Langoliers and The Sun Dog. I don’t recall which one I read first, but I know that while The Sun Dog left little impression on me, The Langoliers absolutely blew my mind. I’d never read anything quite like it in all my years of voracious reading. I went on to read The Stand, followed by It, and by then my addiction was real. So how is The Langoliers? It’s not as mind-bogglingly good as I remember, but it’s not bad, either. The setup is excellent: a motley crew of airline passengers trapped on a plane, all dropped into the deep end of a seemingly impossible mystery. They’re up against two threats: an external threat in the form of the “langoliers,” reality-devouring monsters who “clean up” the past; and an internal threat in the form of one of their own number, who is deeply, homicidally crazy. When this novella was first published in 1990, I suspect that the piece of pop culture it called most immediately to mind was one of two Twilight Zone episodes: “The Odyssey of Flight 33,” in which a commercial airliner travels into the past, or possibly “Nightmare at 20,000 Feet”—two classic uses of air travel as a horror-suspense setting. But a modern reading of The Langoliers evokes instead evangelical Rapture fiction, notably the execreble Left Behind series… which also features a handful of passengers discovering that everybody else on the plane has vanished, leaving behind a scattering of clothes, false teeth, purses, and other uncomfortably intimate items. But The Langoliers predates Left Behind, if not the dispensationalist obsession with the Second Coming; and as the passengers discuss the meaning of what’s happened, nobody ever mentions the Rapture as a possibility. What follows is 200 pages of competent suspense (not horror, really) storytelling. The surviving crew contains the usual assortment of stock characters ranging from the mundane (The Coming of Age Kid, The Writer) to the somewhat ridiculous (the British Secret Agent), and each of the characters gets their chance to shine at some point in the narrative. 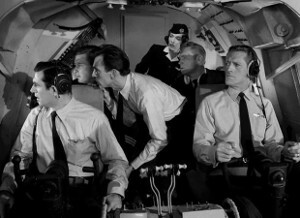 Most of the action takes places on the ground, once the group manages to land their plane; alone in a completely empty and lifeless airport, they use clues in the environment to deduce (with implausible accuracy) the nature of their predicament, and figure out a way to get the plane airborne again and back through the time-warp that brought them here. It’s at this point that the crazy guy (a well-written example of the Insane Psycho, a staple Stephen King character) strikes, and also that the heroes get their first glimpse of the rapidly-approaching, all-consuming langoliers. A redshirt character dies, a few Noble Sacrifices take place, the bad guy gets what’s coming to him, and the heroes finally escape back into the present time. The Langoliers is competent, but strangely for its relatively short length, actually comes close to dragging at points. I have no way of knowing if this is true, but I get the feeling when reading King novels from the mid-1980s through the mid-1990s that somewhere during this period, King’s editors stopped doing much to reign in King’s verbose tendencies. In The Langoliers, as in It and other novels from this era, King belabors routine sequences, lets slips some cringeworthy dialogue (“Now I find myself involved in a mystery a good deal more extravagant than any I would ever have dared to write,” says the writer character at one point) and gets a bit too maudlin when handling emotional scenes. It’s not unenjoyable, but it’s Stephen King at his “safest.” The only glimmers of good ol’ Stephen King viciousness are found in the excellent sequences told from the viewpoint of the doomed, unsettlingly sympathetic psycho character. This is good stuff. But it also feels like Stephen King on cruise control; The Langoliers is caught awkwardly between the cutthroat intensity of King’s early novels and the more mature reflection of his later work. A closing note: The Langoliers is generally referred to as a novella, although at 230 pages I’m not sure why we don’t just consider it a regular-length novel. My guess is that by the late 1980s, King’s legendary writing pace had produced a backlog of novels awaiting release, so his publisher packed the four shortest manuscripts into an anthology and called it Four Past Midnight. Next up: “Battleground,” in Night Shift. Posted on October 14, 2015, 9:43 pm, by Andy, under Books, Horror. The story: “One for the Road,” collected in Night Shift. First published in 1977. Wikipedia entry here. Note that this post contains spoilers not only for “One for the Road,” but for the novel ‘Salem’s Lot. Spoiler-filled synopsis: An aging resident of small-town Maine relates a haunting story from his past involving the dead and cursed town of ‘Salem’s Lot. Years ago, a traveller passing through the area with his family runs off the road in a blizzard near ‘Salem’s Lot (the same town featured King’s early short story “Jerusalem’s Lot”); he seeks help at a tavern a few miles away. The narrator and another local accompany the desperate man to recover his wife and daughter from the stranded car—but when they arrive, both have become vampires. 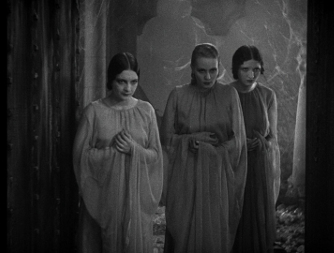 The husband is killed (er, vampirized), and the two locals flee for their lives. My thoughts: Another vampire story! “One for the Road” is best read as an epilogue to the (excellent) vampire novel ‘Salem’s Lot; without that context, it loses much of its impact. Whether or not you read it in connection with that novel, however, this is a short, simple story that belongs to the “Want to hear about something spooky that happened to me?” around-the-campfire genre. It all builds to the vampire encounter in the final pages—a conclusion that is telegraphed from the story’s opening pages but is nonetheless creepy and tense when it unfolds. Cantankerous yet good-hearted rural residents of Maine (my wife, who went to college in Maine, tells me these are called “Mainiacs,” but I refuse to believe that) are a regular feature in Stephen King stories, and it’s obvious he has both a personal familiarity with and a fondness for these characters. When a traveler arrives at a small-town tavern looking for help recovering his wife and daughter from their stranded car, the protagonist and his fellow locals seem reluctant to get involved, which initially strikes us as callous. But as the story unfolds, we learn that there’s a good reason for their attitude: ‘Salem’s Lot, the town where the traveler’s car went off the road, is a “bad place.” Nobody actually likes to say words like “vampire” out loud, but everybody knows that you steer clear of the Lot if you know what’s best for you. In the end, the locals risk their lives to help the traveler, but to no avail: unable to convince him that the vampire stories are true, they can only watch as he falls victim to his now-vampire wife and daughter. If you’ve read ‘Salem’s Lot (and you should—it’s a clever, multilayered novel, and one of King’s best), this story is a nice epilogue, although it doesn’t actually give you much new information. In the novel, the town of ‘Salem’s Lot acquires a new resident: a Stoker-esque European vampire who proceeds over the course of the novel to turn the entire town into vampire slaves. Although the heroes of ‘Salem’s Lot finally manage to destroy the master vampire, they are forced to flee in the face of an entire town of feral, masterless vampires. The novel ends with the only two survivors returning to ‘Salem’s Lot to burn it down. “One for the Road” mentions a massive fire that occurred in the recent past, but clearly indicates that its effect was only temporary, as the ruined town is still haunted by the undead. King’s vampires are intriguingly traditional, especially when you consider that at the time that ‘Salem’s Lot and “One for the Road” were published, Anne Rice was radically redefining the vampire genre by casting the undead as tragically hip aesthetes. King’s vampire mythology, by contrast, is straight out of Bram Stoker: a cultured, highly intelligent, and demonically evil master vampire (served by a still-living “Renfield”) whose victims become monstrous undead who are weaker and subservient, but also possessed of an animal cunning. I’ve nothing against Anne Rice’s take, but after several decades of sympathetic vampires, it’s nice to face off against a flock of inhuman, bloodthirsty, and horrifyingly clever fiends. One last observation: this story’s closing shocker is that the traveler’s seven-year-old daughter is a now a vampire too; we’re meant to mourn this repulsive corruption of innocence. This is a powerful theme (even Anne Rice, with her sympathetic take on the genre, wrings a lot of unease out of the idea of a child vampire). Unfortunately, a decade or two of horror and J-horror films involving creepy children has muted some of the shock value here. Next up: “The Langoliers,” in Four Past Midnight. “The Langoliers” is technically a novella, not a short story, but I’ve been reading it over the last few days. Posted on October 13, 2015, 11:31 pm, by Andy, under Books, Horror. The story: “Umney’s Last Case,” collected in Nightmares and Dreamscapes. First published in 1993. Wikipedia entry here. Spoiler-filled synopsis: A hard-bitten Chandler-esque gumshoe is plagued by the sense that something is “off” as he goes through a typical day on the job. In time, he learns that he is a character in a series of hard-boiled detective novels—and that the author plans to destroy his protagonist and take his place in this fantasy version of 1930s southern California. My thoughts: As I’ve noted before, Stephen King has an unabashed love of hard-boiled detective fiction. “Umney’s Last Case” is both a pastiche of Raymond Chandler and a playful bit of meta-commentary on the art of writing. Let’s look at the pastiche element first. My knowledge of the hardboiled genre is limited, but I know enough to recognize that King here incorporates every cliché (of both setting and language) that the genre has to offer. 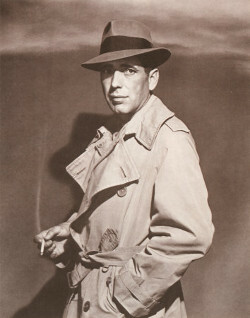 Clyde Umney is a smart-mouthed, sharp-eyed P.I. who conceals beneath his gruff exterior a good heart. His is a comfortable world, both for him and for the reader: it’s full of familiar stereotyped characters (femme fatales, helpful street urchins, leggy secretaries, sinister mob bosses) who act and talk the way we expect, all in a slightly fuzzy, nostalgic version of Los Angeles. But the story begins a shift into Stephen King territory when Umney’s life begins to fall apart: people he relies on leave (often expressing a strange contempt for Umney as they do so), his favorite diner closes, and his landlord is re-painting his dingy office building with bright, cheerful colors. It is not long before a “client” arrives to break the news: Umney is a fictional character, the protagonist of a popular detective series written in the 1990s. The “client” is the author, who (driven by personal grief) is seeking to escape into his own fantasies. Through some unexplained mechanism or act of willpower, he switches places with Umney, settling into Umney’s place and booting Umney into the real world. As the story closes, Umney is starting to get a grip on life in the modern world, which he hates. And he’s learning to write detective fiction, with payback on his mind. As King is wont to do, he mixes lighthearted and serious elements, to mostly good effect. While clearly enjoying the detective genre, he has fun poking its conventions—for example, pointing out the blurry timeline (the genre is set in an eternal late-1930s). But when the story gets weird, it also takes a turn for the serious and even unsettling; we learn about horrible tragedy in the author’s life (death of his wife and child, debilitating illness) that has driven him to take refuge in his own fantasy world. There are numerous references to AIDS (the author’s child died after an infected blood transfusion) that highlight the contrast between the allegedly gritty but actually… cozy world of detective fiction, and the ugly, unfair, disease-ridden world of the present. Beneath the genre emulation, King is asking some interesting questions about the art of writing. What is the relationship between an author and the characters he creates? Is there a sense that they take on a life of their own independent of the author’s plans? These questions have a certain over-earnest “Creative Writing 101” feel to them (and form the basis of his 1989 novel The Dark Half, which also features a writer of pulp fiction whose creations acquire a life of their own), but at the same time it’s fun to see them given literal expression in a story. King writes about writers a lot (eye-rollingly often, really), but between the fun pastiche, the Twilight Zone twist, and the musings about the nature of fiction writing, he makes this story work. Next up: “One for the Road,” in Night Shift (yes, my wife located my lost copy of Night Shift). Posted on October 10, 2015, 11:28 pm, by Andy, under Books, Horror. The story: “The Night Flier,” collected in Nightmares and Dreamscapes. First published in 1988. Wikipedia entry here. Spoiler-filled synopsis: A cynical tabloid reporter stumbles upon what looks like an actual legitimate story: a serial killer who flies a private plane from one rural airport to another, leaving exsanguinated victims behind. The reporter finally tracks down and confronts the killer—who turns out to be a vampire. My thoughts: Stephen King writes good vampire stories. I sometimes think it’s a shame he doesn’t write more of them. Despite that impressive (and generally well-reviewed) listing, I don’t think anybody considers Stephen King a “vampire writer” in the way that, say, Anne Rice is. King writes so many books that touch on so many different horror tropes that he’s never been especially associated with any one specific subgenre of horror. But I sometimes wonder if, when his excellent early novel ‘Salem’s Lot hit it big, King thought about going all-in on vampires. His only previous novel, Carrie, did not lend itself especially well to becoming a franchise. 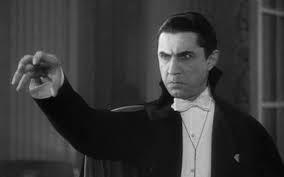 But vampires… vampire stories seem to lend themselves to sequels. It’s not too hard to imagine the murky ending of ‘Salem’s Lot being spun into follow-up novels, the way that Anne Rice turned her 1976 Interview with a Vampire into a decades-long series. In fact King talked for many years about writing a sequel to ‘Salem’s Lot… but for whatever reason, he never did. From what I hear, he claims to have wrapped up the loose ends from that novel in the course of his Dark Tower books. I think that, with a few exceptions, he’s just not a “sequel” guy. While it’s fun to imagine an alternate history in which King fleshed out a vampire mythos across dozens of vampire novels, I’m glad King has never tied himself to a specific type of horror. To be sure, many of his stories bear strong thematic similarities to each other, but when you pick up a Stephen King novel you can be reasonably certain that you’ll be reading something new. King is sometimes dismissed as a pulp novelist who cranks out overly verbose potboilers, but I don’t think he gets enough credit for keeping things different. Ahem. Back to “The Night Flier.” In short: it’s very strong. Richard Dees, a deeply cynical tabloid reporter (and a minor character in King’s novel The Dead Zone, strangely enough), manages to correlate the arrival of a specific small Cessna airplane with a sequence of bizarre murders around obscure rural airports. Guessing that law enforcement and/or the mainstream press will make this connection any minute now, he boards a plane himself to confront the killer at his next port of call (not because he cares about the murders, but because he knows it’ll make a great story). The confrontation goes poorly, although the vampire spares Dees’ life (after exposing his camera film, of course). The vampire elements are interesting enough; as he often does, King puts an ageless and immortal enemy into mundane modern contexts (the vampire is a genteel, caped, Bram Stoker-esque lord of the night who takes to the sky in a Cessna Skymaster rather than bat wings). But the heart of this story is the character of Richard Dees, the jaded reporter. The 30 pages of this story are mostly a character study of a man with almost no soul: Dees is a master of manipulating other people’s emotions (through lurid tabloid reporting and photography), but himself is unable to experience those emotions. As we read, we are initially repulsed by Dees’ callous and contemptuous attitude toward his readers (and most of humanity), but as the story proceeds, that revulsion fades into sympathy. Dees is lost; if he had a soul once, it’s been buried deep throughout the long years of his tabloid career. His encounter with the vampire (and the sight of its slaughtered victims) threatens his sanity, but might also present a sliver of hope: might this experience be so disruptively shocking that he’ll feel something again? We don’t know, and I’m probably reading a bit much into the story. But Dees is a good character. I don’t know if Dees’ demeanor is meant to suggest a specific type of psychological disorder (at points, his lack of empathy makes him seem sociopathic). Regardless, Dees is one of the better characters I’ve encountered in my short story project thus far. Next up: “Umney’s Last Case,” in Nightmares and Dreamscapes. Posted on October 9, 2015, 10:46 pm, by Andy, under Books, Horror. Well, I seem to have misplaced my copy of Night Shift. If you’ve ever been to our house, you know that any book lost amidst the sea of tomes therein is quite possibly lost forever. Hopefully I’ll locate my copy and get to “One for the Road,” but if not, I’ll switch the next story in the lineup to “The Night Flier,” from Nightmares and Dreamscapes. In the meantime, here’s something a little different but still King-related. 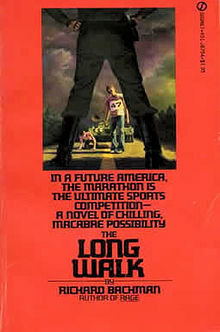 In 1979, King published—under the pseudonym “Richard Bachman”—a short novel called The Long Walk. (After “Bachman’s” true identity was exposed by an alert reader, The Long Walk was most commonly found collected with several other novellas in the 1985 King omnibus The Bachman Books). The half-dozen or so Richard Bachman novels that King wrote are generally thought to have a harder, less supernatural, but more cutthroat edge to them than King’s regular work. King has written about his reasons for writing under this false identity—a mixture of publisher concern about market saturation of the “Stephen King” brand and King’s personal desire to find out whether or not he could replicate his success. The Bachman novels represent a fascinating phase of King’s career that I’d love to explore further as time allows. Without further ado, here are my thoughts, adapted from a review I posted on Goodreads this summer. The book: The Long Walk, originally published in 1979. Wikipedia entry here. My thoughts: Like Stephen King’s other early “Bachman” novels, The Long Walk is not a supernatural or traditional horror story.It is instead a precursor of the “teen dystopia” genre dominated today by the Hunger Games books. Set in an alternate-history modern America, The Long Walk follows the teenaged participants in a gruesome national pastime: a walking marathon that ends when only one walker is left standing. Overall, this is a simple but surprisingly effective story. Recommended if you’re a Hunger Games fan who wants to take a look at an earlier example of the genre, or if you want to read something slightly offbeat by King that isn’t supernatural horror. Next up: The next story in the lineup will likely be “The Night Flier,” as mentioned above. However, if I can fit in another King novella, it will likely be “The Langoliers” from Four Past Midnight. No guarantees about the novella, though—I’ve also got a book group novel to read this month. Oh, the pressures of being a full-time reader! Posted on October 8, 2015, 11:13 pm, by Andy, under Books, Horror. The story: “Lunch at the Gotham Café,” collected in Everything’s Eventual. First published in 1995. Wikipedia entry here. Spoiler-filled synopsis: Steve Davis is reeling from his wife’s unexpected demand for a divorce. He agrees to meet her and her lawyer at a fancy restaurant to discuss divorce logistics, but the meeting goes south when an insane maître d’ attacks them with a butcher knife. After a lengthy running battle through the restaurant, Steve and his wife escape, but alas, Steve’s heroics are not enough to save their marriage. My thoughts: I’ll say it upfront: this story didn’t really work for me. I’ll try to unpack what exactly went amiss. First things first: I was in a bad mood when I read this story. I had just bungled a parenting situation with my four-year-old son, and it was probably a little unfair to demand that Mr. King cheer me up with a blood-drenched story about a murderous waiter. But really, I’m not quite sure what King is aiming for with this one. It may simply be that “Lunch at the Gotham Café” tries to address a few too many ideas in the space of 45 pages; in the course of this story, King earnestly muses on the nature of insanity, the cruel fickleness of women, the difficulty of recovering from an addiction (cigarettes), the jerkiness of lawyers, the quirks of married relationships… all wrapped around a 15-page knife fight scene. The most effective of those things is the knife fight, so let’s talk about that. When it comes to action scenes, King is a believer in extreme detail; he describes every movement, every feint, every swing, every wound, every thought that runs through the protagonist’s mind. This isn’t pointless detail; King knows what he’s doing. The detail serves most obviously to provide a rich mental picture of the scene, but more importantly it stretches out the suspense by making us wait and wait for resolution. The danger is always that the detail will become monotonous, but King is generally aware of the line he shouldn’t cross. This scene isn’t a classic of literary tension, but it works. We wince each time the hero falters, and we cheer each time he gets in a good blow. The other element of this story that works is the rumination on chemical addiction. Steve is a nicotine addict; he decides abruptly to quit smoking after receiving the divorce notice. King writes convincingly, and even movingly, about the psychological ordeal that going cold-turkey presents. King’s struggles with drug and alcohol addiction are well known and certainly contribute to the authenticity of these passages. This theme feels oddly shoehorned into this story, but what’s there works. The rest of “Lunch at the Gotham Café” is unsatisfying. King writes often and well about married couples—particularly loving-but-bickering married couples—but he seems to stumble in his depiction of this failed marriage. Diane, the wife, is portrayed as an unrealistically awful person throughout, and when she coldly rudely rebuffs Steve after he saves her life, we’re expected to sneer along with Steve at her petty meanness. (Her lawyer is mean in that lawyer-joke stereotype sort of way—so of course he dies a gruesome death.) I think that King is trying to give us a provocative portrait of two humans who failed at having a relationship—the wife’s faults are obvious, and we can infer from the narrator’s lack of empathy for his wife and his presumed self-serving exaggeration of her unpleasantness that he probably wasn’t Husband of the Year material—but because we have to experience this through his eyes alone, it feels faintly distasteful. The story closes unnecessarily with Steve musing on the waiter’s insanity and tries to draw a parallel between Steve and the waiter—are crazy people just like us? Who among us might not snap at any minute? Not especially insightful. I feel a bit bad knocking this story, what with my aforementioned bad mood and all. Mr. King, if the stress of dealing with my son’s potty-training difficulties has caused me to unfairly criticize your work, I apologize. But this story is an unconvincing mishmash of Stephen King themes; he’s done this all better elsewhere. Let’s move on. Next up: “One for the Road,” in Night Shift. Who’s Flying That TIE Fighter?